How often have you been stranded on the road just because you didn’t have a wheel-spanner or jack in your car? These are some of the essential tools that every car needs to have at all times, as they can help you out in tricky situations. Cartoq lists 10 must have tools and spares to carry in your car, which can give you peace of mind on a journey, be it just a trip to the office, or a long drive across the country. And most of these tools and spares come with most cars. Always keep the spare tyre in the car. Make sure the spare wheel is properly inflated. Check the tyre pressure of the spare wheel at least once a month to ensure it is always ready for use. Some cars come with space-saver stepneys or spare wheels – where the wheel and tyre is of a different size from the other four that the car is running on. In such cases, the spare wheel is to be used only to reach a tyre shop and not continuously or at high speeds. 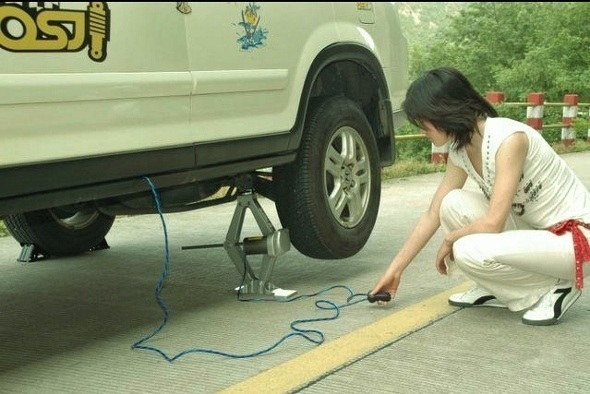 All cars come with a jack as part of the standard tools on offer. Make sure you know the location of the jack in the car and how to operate the jack. Some cars provide a standard scissors jack. Some have a bottle-jack. Yet others offer a hydraulic jack. The jack may be located in the spare wheel well, or under a passenger seat, or even in the engine bay depending on the kind of vehicle you have. Make sure you familiarize yourself with the location and operation of the jack. Some jacks fit only into specific jacking points on the vehicle – make sure you know the location of these points to raise the vehicle. There have been times when motorists have a jack but no jack handle. The jack handle in some cars is not stored along with the jack. It may be located under the rear seat for instance or clipped to the back of the seat, or in a slot in the boot. Some cars also have a jack handle that needs to be assembled first and fits in the tool kit. If you’ve got a spare wheel, jack and jack handle, it’s of no use unless you have a wheel spanner handy. A wheel spanner is one of the standard tools that the car comes with and needs to be in the car at all times. Sometimes, if you’ve swapped your regular wheels for fancy alloy wheels with locking nuts, make sure you buy a wheel spanner that’s compatible with the alloy wheel nuts that you have. All cars come with a set of spare fuses of different ratings for the critical components of the car. These fuses are usually located in the fuse box lid in the car. Make sure you know the location of the fuse box in the car. There are usually two fuse boxes – a main fuse box located in the engine bay near the battery and a secondary fuse box that has the user changeable fuses often located inside the vehicle, near the driver’s side. It is normally just under the dashboard, although in some vehicles, you may have to open up a panel to access the fuse box. It has been mandated by law in India to offer a set of spare headlamp bulbs with the vehicle. Make sure you keep the bulbs safely in the car. Although this law is not that strict in India, it is actually an offence to drive with non-working headlamps. Warning triangles in India are pretty redundant. Although all cars come with the warning triangle as part of the tools supplied with the car, people seldom use them, while some truckers use them to decorate their trucks. Placing a warning triangle at least 30 feet behind the car if its parked on the side of a busy highway is the right thing to do. The problem is it can get swiped or damaged by errant drivers especially in India. A green leafy twig sticking out of the vehicle is what is the local replacement for the swanky warning triangle in many parts! But if you have the triangle, make sure you deploy it as intended. While most modern cars have very little that you can do, carmakers do offer a simple set of tools consisting of a screwdriver and in some cases a spanner or two that can open most of the standard sized nuts and bolts used in the car. Sometimes a screwdriver may be needed to open a panel to access the fuse box for instance. Keep this in the car at all times. If you like, you may buy a more elaborate tool set that as more spanners, pliers, allen keys and other tools that will help you tinker around more – but it’s not something carmakers would recommend you do. Carmakers also supply a first-aid kit with the car that’s mandated by law. The first-aid kit usually has a bottle of antiseptic, some gauze, cotton and sticking plaster. While this is just a token kit, it would be good to carry a proper first aid kit with essential medicines, in addition to what comes with the car. Make sure you check the expiry dates and change the medicines from time to time. In addition to the tools offered by the carmaker, also carry a bottle with drinking water at all times in the car. If not for you, you can also use the water to refill the windscreen wash fluid or just to clean your hands after changing a spare wheel or poking about under the bonnet.